Looking east along Fisher Place from Gawler Place, 13 September 1904. Near side of the Wills premises is 38 1/2 yards east of Gawler Place. Fisher Place is near North Terrace. The red brick three storey Wills Building has bricked in windows and appears to be a warehouse. Fisher Place, north side, looking east, 13 September 1904. Extreme right is 98 1/2 yards east of Gawler Place. The western front of Wills premises is 38 1/2 yards east of Gawler Place. 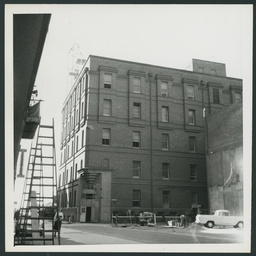 The three storied red brick building plus basement housing G&R Wills and Company stands in Fisher Place. 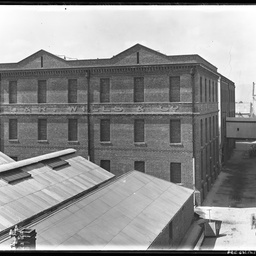 [General description] Colonial Tinware Manufactory frontage on Gawler Place. [On back of photograph] 'Acre 105 / About 1877 / North-east corner of Gawler Place and Grenfell Street / Gawler Place frontage: 47.5 yards. 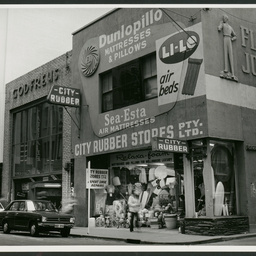 / Grenfell Street frontage (Simpson's only): 19 yards'. 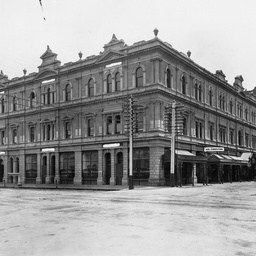 Gawler Place, north east corner of Grenfell Street, 1899. Gawler Place frontage: 47 yards; Grenfell Street frontage: 18 1/2 yards. 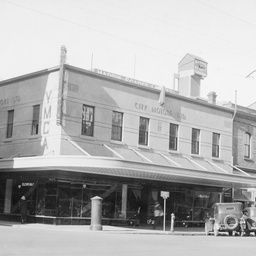 This building was unchanged until 1935, except for the fact that shop fronts were installed in the Gawler Street frontage in the portion of the building which is to the left of the cart. 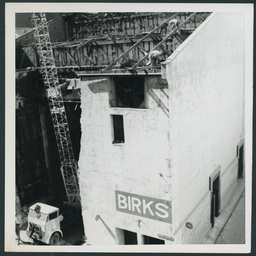 The photograph shows alterations effected in 1935. See B 6763. 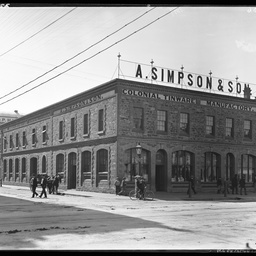 The building houses A Simpson and Son, colonial tinware manufactory and iron and tinplate workers. 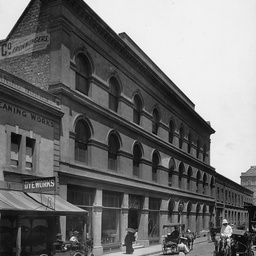 The two storey building holds a commanding position on the corner of Gawleer Place and Grenfell Street. 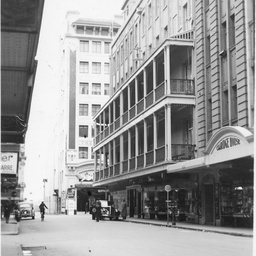 Gawler Place at the north east corner of Grenfell Street, 27th December 1935. 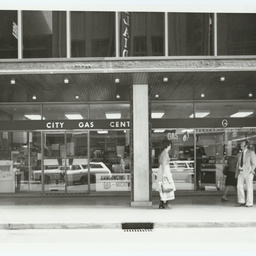 City Motors frontage on Grenfell Street: 18 1/2 yards. The words Y.M.C.A. are cast as a shadow from a sign on the opposite side of Gawler Place. All of the structures shown were demolished in 1955. For alterations effected in 1935 compare with B 5278. 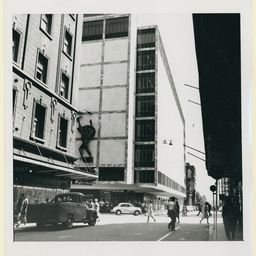 This photograph does not show the complete frontage on Gawler Place and all of the structures shown in this view were demolished in 1955. For building subsequently on this site see B 14545. 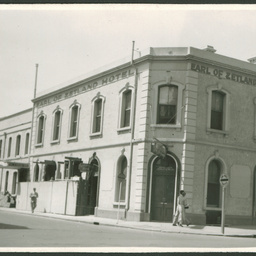 North west corner of Grenfell Street and Gawler Place. Grenfell Street frontage: 40 1/2 yards; Gawler Place frontage: 48 1/2 yards. 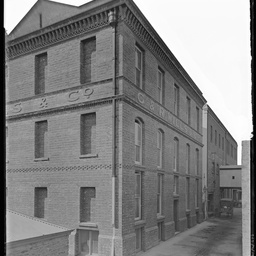 The three storey stone building houses Goode Durrant and Company. Charles Henry Goode was a merchant, draper, businessman, politician and philanthropist in the early days South Australia. He founded Goode, Durrant and Company in 1882. On the Gawler Place side sits Smith and Hawkes, a Cricket and Sports Depot and Cawthorne and Company. South west corner of Gawler Place and Grenfell Street, Gawler Place frontage is 43.5 yards and Grenfell Street frontage is 37 yards. This newly built two storey building has rooms to let. On the Gawler Place side stands H Schulz Hairdresser, and London House. Ladies with parasols are walking by. The flag on top of the building appears to be flying at half mast. 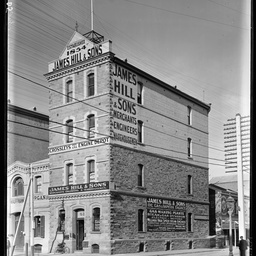 South East corner of Gawler Place and Grenfell Street, July 1st 1902, Gawler Place frontage of Hill's is 20 yards and Grenfell Street frontage is 9.5 yards. At No. 63 the four storey brick building houses the businesses of James Hill and Sons merchant engineers and warehousemen (established in 1854) and Crossleys Oil and Gas Engine Depot. The building also houses Imperial Life Insurance. Kauffman Organs stands at the east of the building. 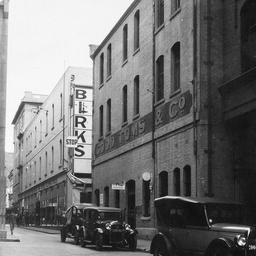 At the side of the building in Gawler Place is the business of Lykke's paperhangers, painters and sign makers. 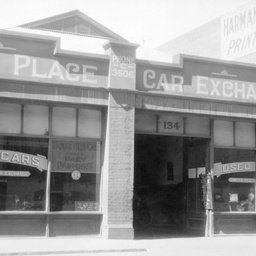 Gawler Place Car Exchange, Gawler Place, east side, March 26th 1935, left side of car exchange is 39 yards south of Pirie Street and frontage is 15 yards. For alterations effected in 1935 see B 6812. 53-55 Gawler Place, west side, 23rd October 1970. Right side of block abuts Featherstone Place, south side. Gawler Place frontage: 18 yards. Gawler Place, east side. About 1901. Three storey building is 5 1/2 yards south of Featherstone Place. Frontage : 41 yards. The building appears to be an ironmongers and north of this stands a cleaning and dyeworks business. Several horse, carriages amd pedestrians are in Gawler Place. 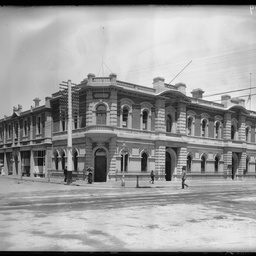 North west corner of Grenfell Street and Gawler Place, Adelaide. On the corner is W.B. 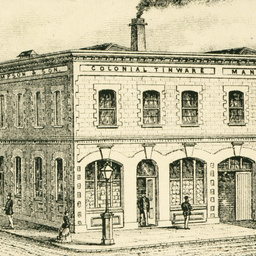 Stephens' stationers and booksellers. Next door is K.Evans' Bon Marche, gentlemen's tailor and outfitter. The two storey building on the right with a verandah stands on the south corner of Featherstone Place. 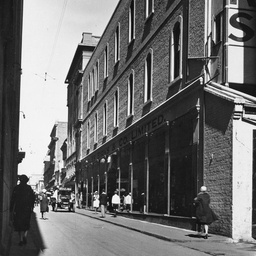 The extreme left is 20 yards west of Gawler Place, and on the extreme right is Rundle Street. 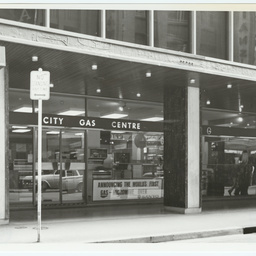 Gawler Place, west side, 11 September 1970. Right side of the building is 21 2/3 yards south of North Terrace. Gawler Place frontage: 8 2/3 yards. 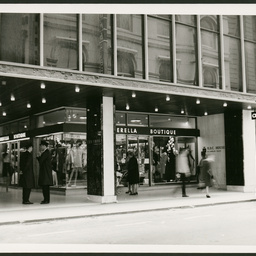 Gawler Place, west side, 11 September 1970. Right side of the block is 21 2/3 yards south of North Terrace. Gawler Place frontage: 44 2/3 yards. 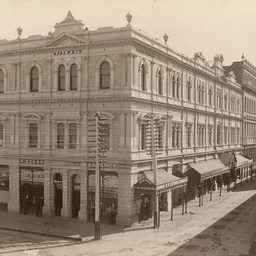 [General description] Looking south along Gawler Place with Birks' Department store on the left. [On back of photograph] 'Acre 44 / Gawler Place / west side / April 23rd 1931 / Compare with B 5864 / Near side of Birks' is 92.5 yards south of North Terrace'. Gawler Place, near side of Toms building is 66.5 yards south of North Terrace and frontage is 21 yards. 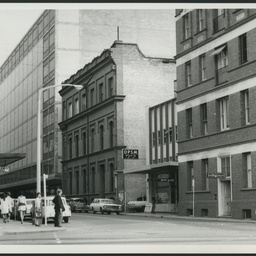 This photograph shows the buildings running along the west side of Gawler Place between North Terrace and Rundle Street. Good Toms Warehouse is in the foreground and Birks is in the background. 61 Gawler Place, west side, 6th March 1970. Left side of building is 68 1/3 yards north of Grenfell Street. Gawler Place frontage: 7 2/3 yards. 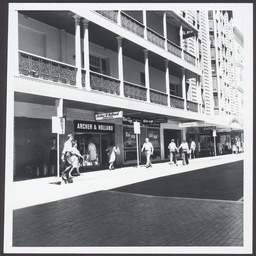 Gawler Place, west side, 24th June 1980. Left side of building is 44 yards north of Grenfell Street. Gawler Place frontage: 13 2/3 yards. 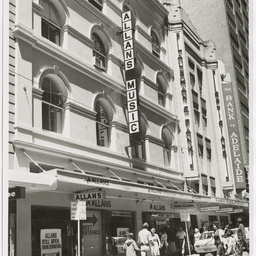 Gawler Place, west side, 24th June 1980 . Left side of building is 44 yards north of Grenfell Street. Gawler Place frontage: 13 2/3 yards. 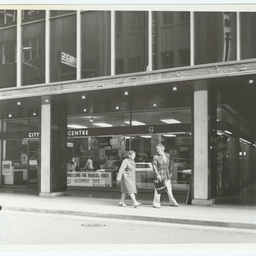 [General description] Looking north along Gawler Place towards Rundle Street. On the extreme right is Claridge House, then the Oriental Hotel (with the balconies). 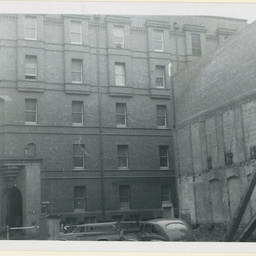 [On back of photograph] 'Acre 82 / Gawler Place, east side / 25 June 1940 / Additional stories were added to the near half of the Oriental Hotel in 1939 / Compare with B7483 / The balconied building is the Oriental Hotel which has a frontage extending 33 yards south of Rundle Street'. 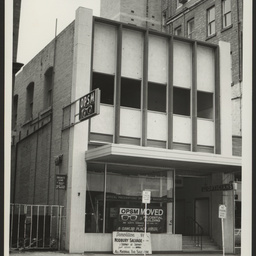 Gawler Place; East side, 13 January 1978. Gawler Place frontage is 34-1/3 yards. Left side of building abuts Rundle Street. 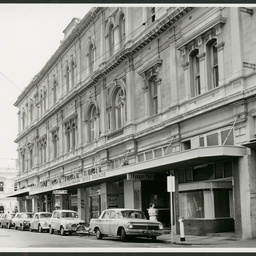 Gawler Place, East side, 28 October 1977. Left side of building is 60m south of Rundle Mall. Gawler Place frontage is 19m. 67-69 Gawler Place, west side, 27th November 1970. 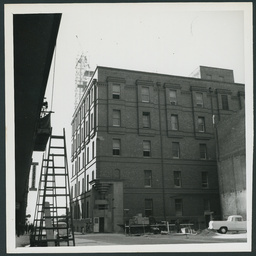 Left side of building abuts Grenfell Street, north side. Gawler Place frontage is 50 yards.